The goal of Physical Science-Oncology Projects is to promote a “physical sciences perspective’ of cancer and foster the convergence of physical science and cancer research by forming small transdisciplinary teams of physical scientists and cancer researchers who work closely together to advance cancer biology and oncology understanding. 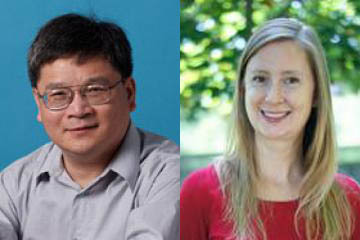 Dr. Thomas and Dr. Zhu’s project, conducted in collaboration with Dr. Michelle Krogsgaard from the New York University School of Medicine, will investigate how tumor microenvironment impairs in situ interactions of T-cell surface molecules with counter molecules on melanoma cells to suppress anti-tumor immunity. The research integrates the use of physical science tools to develop new insights into cancer progression with the long-term goal of better understanding the underpinnings of the disease, furthering the development of better screening methods or therapies to treat patients. Dr. Cheng Zhu received his Ph.D. from Columbia University in 1988. Dr. Zhu is interested in the molecular biophysics of the immune and vascular systems, with a focus on the mechanobiology of T cells and platelets, with respective applications to tumor immunology and thrombosis. He pioneered the in situ analysis of interactions at the junctional interface between molecules anchored to two apposing surfaces. His lab conceptualized and demonstrated several types of mechanical regulation of protein unbinding and unfolding in a number of receptor–ligand systems. Dr. Susan Napier Thomas’ laboratory investigates mechanisms of cancer progression including metastasis and, in particular, the role of lymphatics in directing immune suppression within the tumor microenvironment. Her lab also develops drug delivery strategies and technologies to enhance cancer immunotherapy. She trained as a Whitaker postdoctoral scholar at École Polytechnique Fédérale de Lausanne and received her Ph.D. from The Johns Hopkins University.